She is blind but talented, and she brings light to darkness. 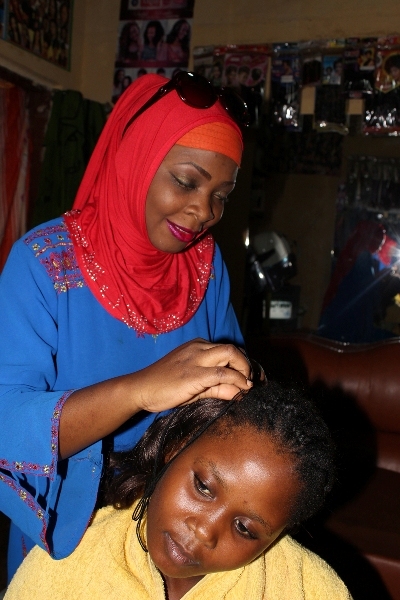 She is Aisha Bahati, 21, a blind hair dresser who can plait all sorts of hair styles. It is magical how she does it all. Aisha’s hair saloon is in Kibuli. Her saloon is a busy house with young girls plaiting and others learning how to plait. She came over to me with a smile and ushered me to feel at home. Our long and interesting conversation propelled into a deep understanding of who Aisha really is: what had befallen her sight and life and how she has managed to beat all the odds of this disability to make a living through hair dressing. I traveled to Magamaga Sub-county in Mayuge District, where I met Mrs. Fatuma Kikuno, her mother. Bahati is the last born in a family of nine children of Mr. Asad and Fatuma Kikuno. Bahati was only seven years old when she developed a sever fever. “We rushed her to the nearby clinic where she received treatment. The following day she started developing some swelling on the skin as she also complained of itching face. She did not improve. 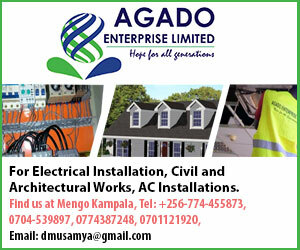 “We then moved to a hospital in Jinja where we spent one month. When we returned home barely one month after, her eyes started itching uncontrollably. The pain was too much. We returned to the hospital. One month later, as she was there, she lost the sight in one eye. Soon after, I realized Bahati had lost sight in the other eye, too. She was now blind!” Kikuno told me. Bahati was seated quietly listening to our conversation. Turning to her, she merely smiled and said that there was little she could have done but only live on with this sad reality. “I was too young to understand anything at the time,” Bahati said. She was in Primary Three at Top Care Primary School in Jinja when she suffered this calamity. Thereafter, she spent her entire life at home being schooled with by her peers and family. It was her mother, other siblings and friends who taught her how to read and write. “My mum bought me a doll shortly after I lost my sight; it was meant to kill boredom as I was all alone at home as my brothers and sister went to school. In turn I would spend my time playing with it, but soon I started plaiting its hair. The more I practiced the better I became to the extent that I even started plaiting hair of my friends in the village as well as some kids. “I will never forget that time when I plaited a local artiste who had come home with my brother and he gave me ten thousand shillings, I was very happy. “I was inspired and got more kids to plait their hair, especially during festive days. I would be busy making my own money. This marked the start of my long-life career,” Bahati notes. Bahati’s career was further reinforced when her mother decided to take her elder sister, Sumin Nanyonjo, for a two-year fashion and beauty course. Nanyonjo would instruct her on phone on the latest hair styles. “I knew how to read and write so she would call me and tell me what’s trending and when she returned for holidays or over weekends I would do exactly what she had told me,” Bahati narrates. Nanyonjo her sister’s life was dependent on her. So she backed up Bahati’s state after enrolling for this course. “She knew I shared with her whatever little details and trending hair styles on phone. She was back in the village and I was in Kampala but being a fast learner she did exactly what I shared with her,” Nanyonjo said. Indeed the two sisters have been living together and operating their one-room saloon since 2010. It was first in the slums of Nsambya before it shifted to Kibuli. The two live like twin sisters and it is hard to imagine Sumin without Aisha and vice versa. Nanyonjo acknowledges that Bahati is fun to be around. “She is a selfless young girl and a skilled hair dresser,” Nanyonjo says. Shamila Shaha, one of Bahati’s loyal customers, whom we found Aisha working on, speaks fondly of her. On their first encounter with Aisha, Shaha says, “I was scared to see her work on my hair for the first time after sensing that she was blind. first. “On first sight, it is hard for one to realize that Bahati is blind. However, with time I got used to her, she has become my favorite in the saloon. When I walk in I sit and wait for her to design my head in whatever style she pleases and I can say all she comes with has always worked for me,” Shaha says. Sometimes Bahati says she prefers to work in her sun glasses just to re-assure her new clients. “Some detest me immediately when they realize I am blind, the stigma is intense but because I have to survive I work selflessly to impress all that I work on,” Bahati admits. Amina Nakadama, another client, noted that she could not believe a blind person could plait until she looked for Aisha after seeing her at the Miss Tourism Independence Beauty Contest. The Miss Tourism Independent Contest happened on August 28, 2015-2016 at the Kampala Serena Hotel. “I was scouted, recognized and awarded by the late Tourism Minister, Maria Mutagamba, for showcasing exceptional talent and skills in hairdressing and singing despite my disability,” she says. Bahati has endured all this pain, stigma and frustration, because she has seen a bright future behind her disability; that she does not see, did not mean the end of her life or resorting to begging to earn aliving. She is a living example for those also living with visual impairment and people with disability to realize that everything is possible. From Aishas perspective of disability, she thinks that other people with the same problem of even greater should have change of mind and perspective, my fellows with different form of disability should be positive and learn to work for themselves this way they will overcome the daily life struggles. Aisha says negativity and looking at disabled people as useless in the society has come with a lot of challenges and that’s why many have resorted to life in the streets. Begging and looking for a livelihood but its cost are far more painful because some disabled women on the streets are sexually abused and they end up in even more trying situations than if they were doing simple things for themselves. Looking at Aisha’s life one would not be wrong to say that she is versatile in her field, she can plait braid, weave, twist, three in on and deadlocks. Forget about having a magical hand, Aisha is a multi talented performing artiste with over five songs to her name. Her recent hit is Akwagala, in which she shows some considerable level of lyrical power in her soft voice. Producer Asub Khan of Target Records told us that Bahati is very talented but lacks support to take her music career to the next level. “I have composed for her a number of songs and she understands it quite well,” Khan says. Asked if this meant anything to her hair-dressing career, Bahati responded saying it is a matter of time and both music and hair-dressing will find the right support for any of the two to drive her on for the rest of her life. As she struggles to make ends meet, a visit to Agawal Medical Clinic presented her with new dreams. A medical scan which has been conducted found all her nerves normal and doctors reveal that there is a possibility of her to regain her sight. For this, she needs about UGX 25 million shillings for an operation. Dr. Amina, a specialist at Agawal noted that there was a high chance that Bahati would see again since she could sense light rays and given the fact that her nerves were still normal. 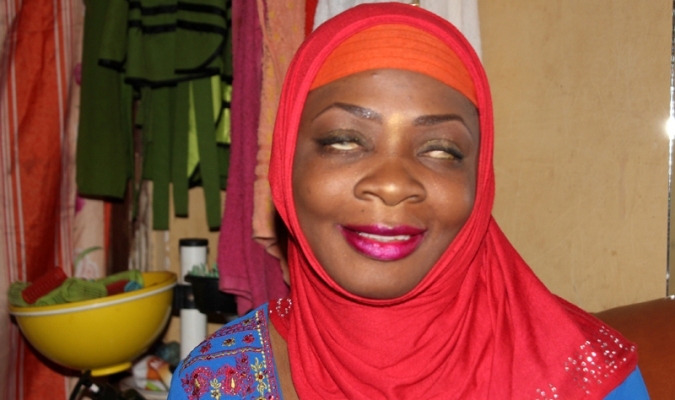 However, with the good news poping in Aisha has little of nothing hope to restore her sight. She is too poor to afford all her saving have been used in the pre-medical test and support, doctors still expressed worry that the longer she spends without the operation, the more the nerves will eventually become weak and be prone to cancerous infections. “If there is any good samaritan out there willing to help me, I will be most grateful. I have done a lot even without my sight so I believe I can still do extra more if my sight is restored only if I can get well-wisher to help me with the 25million shilling,” pleads Bahati.